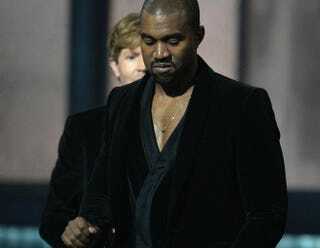 Beck (background), winner of the Grammy for Album of the Year, reacts as Kanye West leaves the stage during the 57th annual Grammy Awards in Los Angeles Feb. 8, 2015. Kanye West has had a change of heart. After lambasting Beck’s Grammy win, West sent out a heartfelt (sarcasm) apology via Twitter to the Album of the Year winner. When Beck won his award, Beyoncé’s No. 1 fan expressed his displeasure and stated that Beck should give his award to Mrs. Carter. Now I guess it’s OK for Beck to keep his award. West also tweeted out an apology to Bruno Mars. But did anyone actually know he had beef with the singer? Because I definitely didn’t. How can you have beef with Bruno Mars? West then expressed his desire to have Mars work on an upcoming project. Or for talking dirty about his ex-girlfriend, Amber Rose. Or for releasing that hideous music video of him and his wife riding on the back of a motorcycle. Or for stating that it's OK for grown men to date minors. Especially for not keeping his promise to Mr. Rainey.